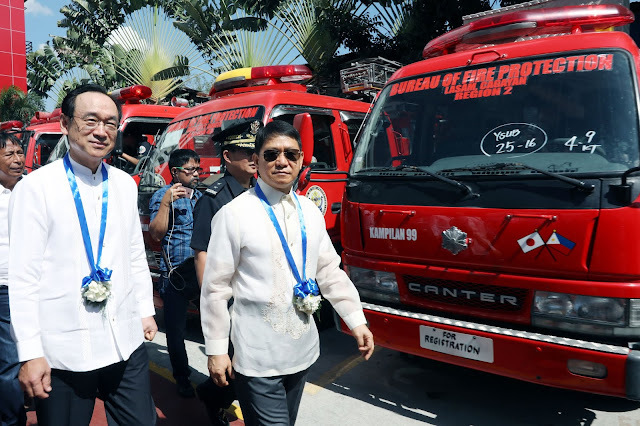 MANILA -- Twenty-one cities and municipalities will benefit from the new emergency vehicles donated by the Japanese government to the Bureau of Fire Protection (BFP). During the turn-over ceremony at the BFP National Head Quarters in Quezon City on Monday, Japanese Ambassador Koji Haneda expressed hope the vehicles "would not only serve as a steady channel of support for BFP personnel on the ground, but also a concrete reminder that BFP has a close ally in Japan." The latest donation, consisting of 14 ambulances, six pumpers, and two rescue trucks, is on top of the 54 emergency vehicles the Japanese government donated in the Visayas and Mindanao since 2014. The ambulances and trucks will be dispatched to the municipalities of Sta. Maria in Pangasinan; Bauang in La Union, Solano and Bayombong in Nueva Viscaya; Sta. Maria in Bulacan; Lubao in Pampanga; Odiongan in Romblon; Goa in Camarines Sur; Sta. Marcela in Apayao; Lasam in Cagayan; and Maoyoyao, Lamut, and Kiangan in Ifugao. Also receiving the donation are the cities of Tuguegarao, San Jose in Nueva Ecija, Olongapo, San Fernando in Pampanga, Imus in Cavite, Calamba in Laguna, Ligao in Albay, and Baguio. The donation is part of the Japanese government's Japanese Grant Assistance for Grassroots Human Security Projects (GGP). In his speech, Haneda said Tokyo would aim to "extend every assistance we could possibly can" to help Manila in strengthening its institutional capabilities and become better equipped. "A week ago, I saw in the news how 150 families were sadly affected by a recent fire in Tondo. The immense damage these incidents have caused is something we want to abate by all means," he said.